After 10 years of planning, the highly-anticipated $41 million Elinor Bunin Munroe Film Center opened its doors this summer to rave reviews, and gave us the opportunity to introduce VividGlass to a new audience of movie lovers. The project was for the renowned Film Society of Lincoln Center, a cultural institution in Manhattan since 1969, whose programs were previously limited by access to one lone screen at the Walter Reade Theater. The new 17,518-square-foot complex on West 65th Street, designed by David Rockwell, will now be able to offer theatrical movie runs, film classes, seminars, and other social events creating a new hub of activity for film fans. The center features a café and lounge, two screening rooms and an open amphitheater featuring a 152-inch Panasonic HD plasma screen, the nation’s largest. 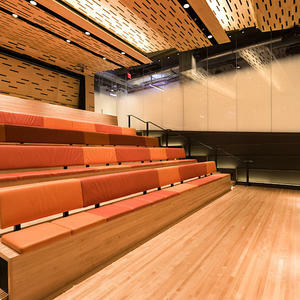 Due to that attention to detail, stunning 33-foot long, 14-foot high VividGlass partition walls were chosen to line both sides of the auditorium. 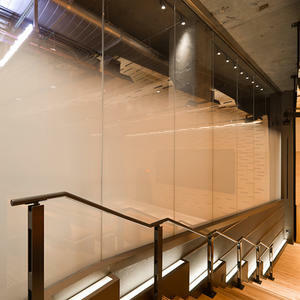 The architectural glass is comprised of two lites of 10mm low-iron tempered glass in a ViviGraphix Gradiance pattern called Scatter, which is opaque towards the bottom and fades to transparency at the top. This allows for privacy with an open feel that doesn’t block the light. 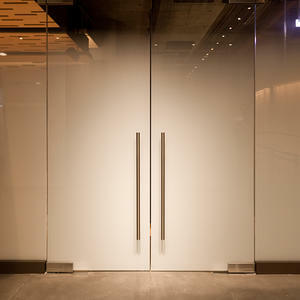 The same glass is also featured on the front doors and transom lites. 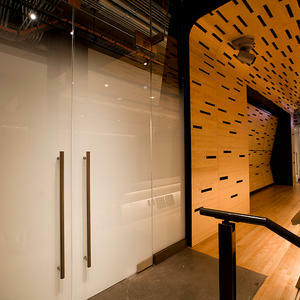 We’re delighted that VividGlass was incorporated into this beautiful new facility. If you are interested in what VividGlass can bring to your next project, contact us.